(Refer back to the main RMarkdown lesson). INSTRUCTIONS: Following the horizontal lines below, beginning with the Introduction heading, is a report that is produced from an RMarkdown document. Write an RMarkdown document and “Knit HTML” to produce a report similar to what you see below. Start by clicking on the menus: File, New File, R Markdown…. Choose HTML document, and give your document a title and an author’s name. Using the appropriate Markdown syntax and embedding RMarkdown chunks, reproduce the report below. (Feel free to copy and paste text as needed). Ensure that the bold, italicized, and fixed width text come through in your document. Fixed width text is produced by enclosing text in backtick characters (the key above the tab key, to the left of the number 1 key on most keyboards). For the faceted figure at the bottom, see the help for options here or here to set fig.width and fig.height to 10. Ensure that this report is fully reproducible. You can assume that any computer this runs on will have the appropriate libraries installed (dplyr, readr, ggplot2), and that the data to read in is correctly placed in the data/ directory relative to the current working directory. THE REPORT THAT YOU SHOULD PRODUCE FOLLOWS BELOW. Below we will load the dataset and proceed with a very basic analysis. After loading the dplyr and readr libraries, use readr’s read_csv() function to read the data directly from the web, assigning it to an object in our workspace called ydat. then show only the top 20 results. Create a new object that contains the data filtered down to the 36 genes involved in cell wall organization and biogenesis. 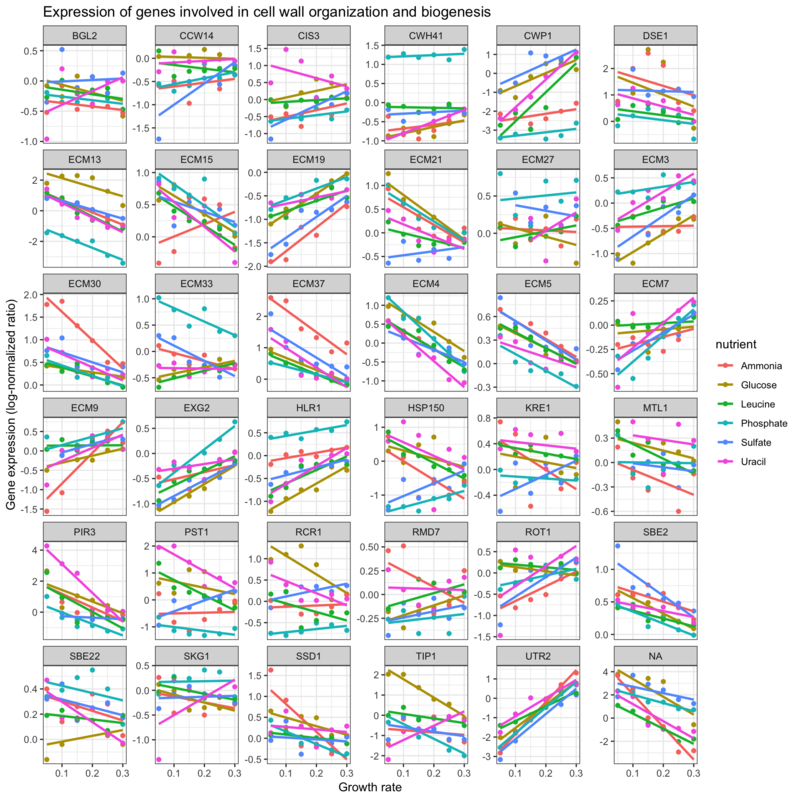 Plot a scatter plot of the expression versus rate, color-coding by the limiting nutrient, showing a different gene in each panel, where the y-axis scale in each panel can vary from panel to panel.